US-Latin America: The year in review, live at 6PM Eastern, and available at your convenience after. I said “Chavez is in Caracas”, when I should have said he’s in CUBA, aargh! Muslims sense of belonging in Argentina, ratifying their right and proud to be Argentine citizens, challenges the sense of injustice that the Muslim community faces, unjustly, in the 21st century-world. A day after power outages left travelers at Rio de Janeiro’s international airport in the dark, President Dilma Rousseff tried to calm fears that Brazil was facing the kind of energy shortages that upended national politics a decade ago. Armed men stormed a town in the mountains of the western state of Sinaloa on Christmas Eve and shot nine men, then dumped their bodies as part of a war between Mexico’s two most powerful cartels. Mr. Peña Nieto’s six-point program includes better government planning; increased intergovernmental coordination; protection of human rights; more social investments and crime-prevention programs; additional evaluation of government programs; and institution building. It also proposes a 10,000-member force to secure municipalities and states where law enforcement is powerless against organized crime. The administration has said it will focus on street gangs and criminals employed by the cartels, a shift from former President Felipe Calderón’s emphasis on eliminating top drug trafficking bosses. The murders of four Americans during a seven-hour long attack, due to “sloppiness”? Twitter users are rightfully outraged by President Obama’s callous dismissal of the incompetence that caused the tragic deaths of four Americans in Benghazi. This is not about sloppiness. Sloppiness implies security was implemented, but did it in a manner leaving things in a state disarray. Mr. President, you didn’t implement anything, you removed it and in doing so, thereby leaving your Ambassador Stevens and his staff wide open to attacks. Attacks this administration was warned about from several sources. What transpired wasn’t sloppiness, it was criminal. In other news, Al-Qaida’s branch in Yemen has offered to pay tens of thousands of dollars to anyone who kills the U.S. ambassador in Sanaa or an American soldier in the country. Ahem. Obama conducted an unauthorized war against Moammar Qaddafi that decapitated the regime the previous year, which gave free reign to networks of Islamist terrorists in eastern Libya. That was no secret; in fact, it was pretty well known that those “militias” participated in the uprising we enabled. There had been a series of attacks on Western interests by these networks in 2012 before the September 11th attack that killed four Americans, including a few attempts on Americans before that. Despite all this data, State deliberately dismissed military security for the consulate and insisted it could rely on local militias for security. And this is “just some sloppiness, not intentional”? Hugo Chávez hasn’t tweeted since November 1st. His family and his VP are now in Cuba, supposedly at his bedside. Evo Morales had traveled to Havana but was not allowed to visit with Chavez. The Chavez government released 11 political prisoners last night. A lot of people think he’s dead; others say he’s in an induced coma. Journalist Nelson Bocaranda, who’s traveling in South Africa, tweeted that the news from Havana is not good, which is why the VP and other ministers met at the hospital in Havana. Escribo desde Johannesburg: Noticias desde La Habana no son nada alentadoras. Por eso la presencia de NMaduro&otros ministros en CIMEQ. So, as you can see, we have again endless rumors about a Latin American dictator dying or not in Cuba. As I have said multiple times about Fidel Castro, I’ll believe it once the official announcements are made, the corpse is shown to the public, and the CSI people can confirm it’s him. Until then, the only “advantage” dictators get from that excellent free Cuban healthcare is a cloak of secrecy. Hillary hospitalized with blood clot. Hillary, who shall remain concussed until next week, has taken her concussion on holiday to Punta Cana in the Dominican Republic. Gateway Pundit posts that Hillary Clinton So Sick She Had to Travel to Punta Cana Resort to Celebrate the New Year. According to press reports, the Clintons will celebrate New Year’s at the Puntacana Resort & Club and could also attend a fashion show scheduled for December 29, which will be held in honor of famous Dominican designer Oscar de la Renta. Linked by Pirate’s Cove. Thank you! State Dept. Says Clintons Are Not Partying in Dominican Republic as Was Reported; where are they partying, then? @iowahawkblog State Department denies. Apparently she is partying somewhere else? Did she have a facelift, maybe? Mexican authorities have discovered a sophisticated smuggling tunnel equipped with electricity and ventilation not far from the Nogales port of entry into Arizona, U.S. and Mexican officials said Friday. The Mexican army said the tunnel was found Thursday after authorities received an anonymous call in the border city of Nogales, Sonora, south of Arizona. U.S. law enforcement officials confirmed that the Mexican military had discovered the football field-long tunnel with elaborate electricity and ventilation systems. U.S. Border Patrol spokesman Victor Brabble said the tunnel did not cross into the U.S.
More than 70 such tunnels have been found since October 2008, most of them concentrated along the border in California and Arizona. In Nogales, Arizona, smugglers tap into vast underground drainage canals. A group of armed men stormed a town in the mountains of the western state of Sinaloa on Christmas Eve and shot nine men to death with assault weapons, then dumped their bodies on a sports field as part of a war between Mexico’s two most powerful cartels, officials said Wednesday. Sinaloa state prosecutor Marco Antonio Higuera Gomez said the town of El Platanar de Los Ontiveros had become part of a dispute between the Sinaloa cartel controlled by Joaquin “El Chapo” Guzman, Mexico’s most-wanted man, and remnants of the Beltran-Leyva cartel who have allied themselves with the Zetas, a paramilitary organized-crime group founded by ex-members of the Mexican special forces. Another cartel fight is raging to the south, along the border between the state of Jalisco and Michoacan. At least seven people have been killed in the area since Sunday. Officials in both states said Wednesday they could not confirm local media reports of more than a dozen new deaths in clashes in the area. Michoacan authorities did report the slaying of a mother and her three children in the capital, Morelia, which has been mostly spared the worst of the state’s drug violence. Prosecutors said 41-year-old Maria Elena Lopez Bautista and her 19-year-old daughter and 18- and 13-year-old sons appeared to have been tied hand and foot with wire and burned to death inside their home on Monday. Officials did not speculate on the motive for the crime, but the border with Jalisco has been hit by clashes between Michoacan’s dominant Knights Templar cartel, and the New Generation cartel that operates in much of Jalisco. 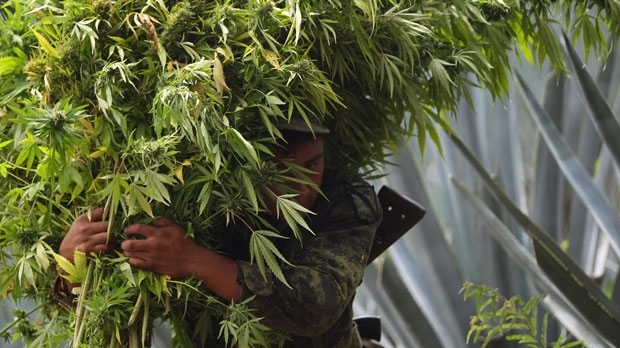 With the PRI back in power in Mexico, and marijuana legalization in the USA, 2013 will be an interesting year.